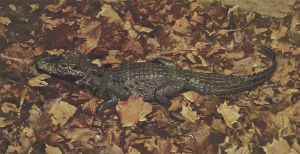 Western Africa is the home of three kinds of crocodiles: the Nile Crocodile, which once ranged from the Cape to the Mediterranean; the Armored Crocodile, restricted to the rivers and the great lakes of Western and Central Africa; and the West African Dwarf Crocodile, isolated in the smaller rivers and ponds. 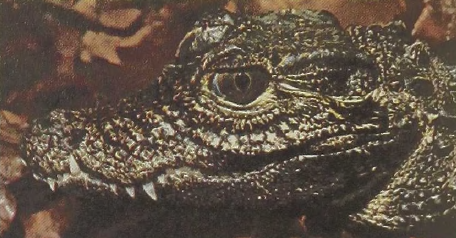 Two separate populations of short-snouted dwarf crocodiles occur: that of the extreme West African forests is characterized by an anteriorly bent snout, while that from northeastern Zaire has a more nearly straight snout. Although the maximum size of modern crocodiles ranges from 20 to 25 feet in length, the adult dwarf crocodile is less than 6 feet long. 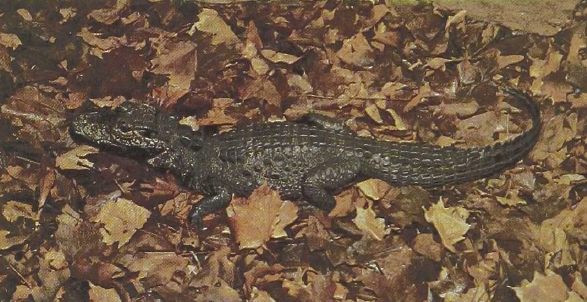 It would be interesting to know how these small animals compete with juvenile specimens of the Nile Crocodile, which are known for their propensity for walking long distances up river courses and which may, therefore, occasionally coexist with this short-snouted species.